I recently talked myself into buying a thermal imaging camera -- I've wanted to get one for quite a while, but the $5K+ prices just put them out of reach. But, FLIR came out with the I series of entry level thermal cameras last year, and then dropped the price quite a bit recently -- it was too much -- I succumbed and bought the I7 model. They are still not cheap -- the I3 with 60 by 60 resolution is $1200, and the I7 I bought at 120 by 120 resolution was $2000. 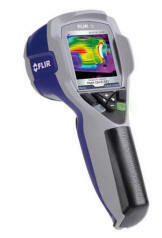 The camera basically measure IR (heat) radiation from the objects you are taking the picture of. The camera software uses the IR radiation levels and your estimate of the emissivity of the object to estimate the surface temperatures of the object. The camera converts the temperatures into a colored image where each temperature maps to a color shade. Thermal image of Kristy the dog. My main reason for buying the camera was to be able to get an understanding of temperatures on the absorber and glazing of solar collectors with an eye toward making changes to the collector to improve heat output. This is something that is hard to do with ordinary instruments as its really helpful to know what's going on all over the absorber surface, not just in a few points. For my camera with 120 by 120 resolution its kind of like being able to place 14000 thermocouples on the absorber -- amazing! This is an image of a backpass style solar air heating collector. Backpass style solar air heating collector. 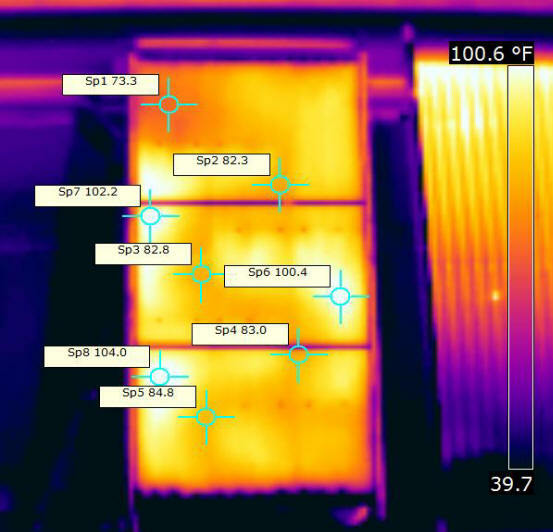 As you can see, it shows the surface temperatures of the full absorber from where the cool air enters in the upper left down the serpentine path through the internal baffles and out the lower right. You can see immediately that there are places where the absorber is running much hotter -- these correspond to pockets of dead air where baffles are not working well. In these areas, the absorber just heats up until it can lose most of its heat out the glazing, which makes the collector less efficient. I don't know of any other way to get this kind of detialed picture of what's going on. Anyway, there is quite a bit more at the link above -- have a look. Another way to get this kind of detailed picture (and much more!) would be to perform a computational fluid dynamics simulation of the heat losses in the collector. OpenFOAM (http://www.openfoam.com/) is a widely used, open source tool to perform such numerical simulations.